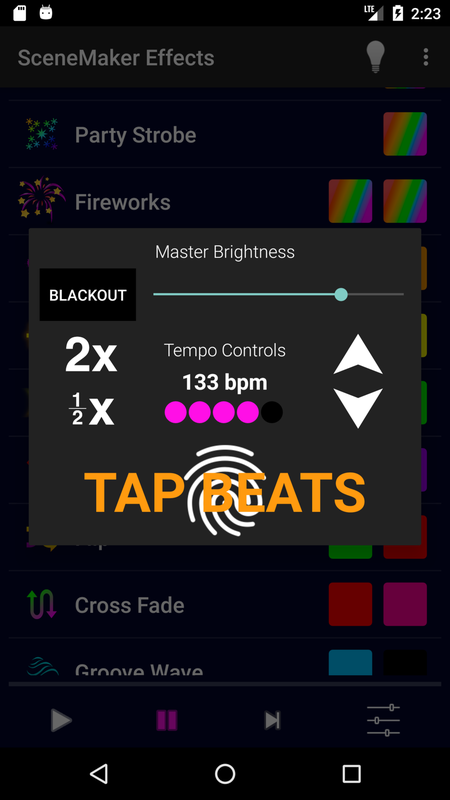 Light DJ for Android includes all three classic Light DJ controllers including the music visualizer, beat-synced SceneMaker Effects, and the Matrix Strobe Maker. Works with Philips Hue Entertainment, LIFX, and Nanoleaf. Put on some music, then press Play on the Visualizer. There is a Mellow Effect and an Active Effect. Active Effects happen during louder parts of the song. The Mellow Effect is slower and happens in the background when your music isn’t as active. You can select colors in 2 different ways: for a quick change you can drag from the color dot to the Active Colors box. If you want more color options, select a color box and you’ll get a menu to further customize the colors. There is an option to Magically Change Colors, which tries to detect good times in the music to change the colors automatically. For the Volume Trigger, set it lower for more effects or higher for less effects. Once you have it set in the app, adjust your speaker volume slightly if you want more/less effects. Press on the colors to customize the colors. Each row is a different effect that will match the beat of your music. Press on an effect icon/row to start it, or press the Play button. The effect will play for 32 beats as a default, then go to the next effect. If you want the lights to stay on the same effect, press the pause button. This will pause the controller, but not the lights. The effects will match the tempo of the music you're listening to.Open the Controls menu to access the tempo controls. That’s where you can adjust the speed of the lights and brightness. "Blackout" will turn all lights off and stop all effects. Tap the tempo into the TAP BEATS"button to set the tempo quickly, or use the arrows. There is also an Advanced Settings menu where you can adjust effect duration, fine-tuning delay, or disable the controller from auto-playing effects. The Matrix controller is a light toy that you can play with while listening to music. You tap on the grid, while music is playing, which creates the effects. If you want the lights to continue when you’re not pressing down on the grid, you need to press the lock button while holding down on the grid. Then the lock will enable and you can let go and the lights will keep going. You can change the effect in the top bar and the effect will activate while pressing on the grid (or while the grid is locked.) Try changing the effect in the top bar then press and hold on the grid; you should see a different effect on your lights. 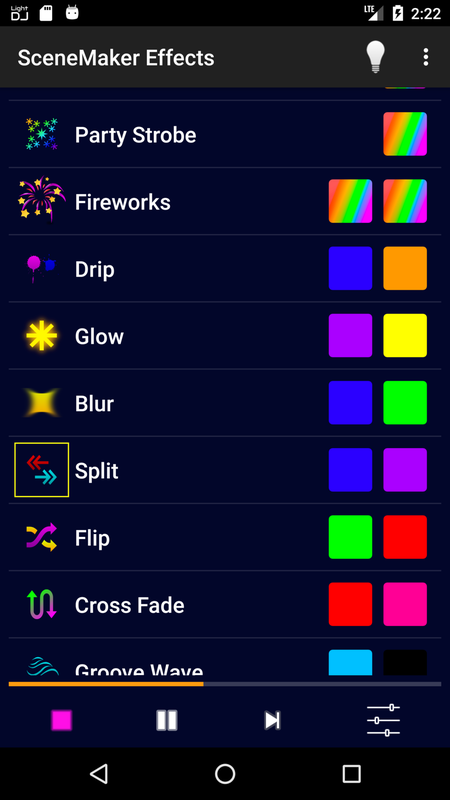 If you'd like to try Light DJ, you can download the app for FREE and try all of the effects today. Each new subscription includes a 7-day free trial and includes full access to all of Light DJ's effects and controllers, periodic updates to support new hardware and features, direct email technical support, and 2 hardware-specific bonus effects each month. Cancel anytime.